The Project Rise launch event held in Govandi, Mumbai. Imagine an alley so narrow that you couldn’t walk without your shoulders brushing against the blackened walls. So dark even during broad daylight, that you could barely make out the face of oncoming persons while you turn sideways to let them pass. The stench of sewage from the flowing canals underfoot and an inescapable sense of despair as you watch the alley snake continuously before you with no visible end. Thousands of children are born under these and other kinds of dire conditions and spend the better part of their lives there, if they are fortunate enough to make it that far. During the course of a routine visit to the Govandi slum in Mumbai, we came across one such child. baby Noman. A fragile little boy barely nine months of age. As he clung to his mother it was plain to see that Noman was severely malnourished. The nutritionist from the Fight Hunger Foundation accompanied by volunteers from the Dawoodi Bohra community inquired how Noman was responding to the treatment and rejuvenation program in which he had been enrolled a few weeks back. She said he was much better. Noman along with hundreds of other children in the same predicament are now part of Project Rise, a Dawoodi Bohra community initiative in partnership with Fight Hunger Foundation to rescue children from hunger and malnutrition. Fight Hunger Foundation is an NGO that has dedicated itself exclusively to combating hunger and malnutrition in children across rural and urban India. ‘Desire for others what you desire for yourself’ the Dawoodi Bohras have long engaged in philanthropic efforts targeted towards their fellow citizens. Among these initiatives, the provision of food to the needy is the most prevalent. His HolinessTUS ceaselessly urges his adherents to feeding the hungry, as hunger is an affliction that regrettably affects millions of people. The heartfelt appreciation and well wishes that spontaneously emerge from those who are rescued from hunger are an inspiration to keep striving for the cause. As the name suggests, Project Rise aims to rescue children from the vicious grip of malnutrition and raise them from poverty and illness to a point where they have a chance to realise their potential and chase their dreams. It is also an opportunity for community members as well as others to rise to the occasion and support the cause. And it all begins with proper nutrition. Tackling malnutrition is no straightforward process. When a child’s body has gone so long without proper nutrition, re-establishing a regular intake of food is a slow and tedious process. The body’s first reaction is to reject the very sustenance necessary for its growth, which is why specially formulated nutrition packs are administered over time after which normal intake of food can resume. Project Rise is currently underway in Govandi in Mumbai and Mohkada in Palghar district with the will and intent to keep expanding and diversifying into other regions as well as other spheres of charity and upliftment. To officially launch the project and celebrate this partnership with Fight Hunger Foundation, an event was held in Govandi on the 20th of June. Representatives from the community and the foundation invited local families to a presentation that outlined the details of Project Rise and sought to create awareness about the plight of hunger and malnutrition in children after which they were treated to a hearty lunch courtesy of the Dawoodi Bohra community kitchen, FMB. 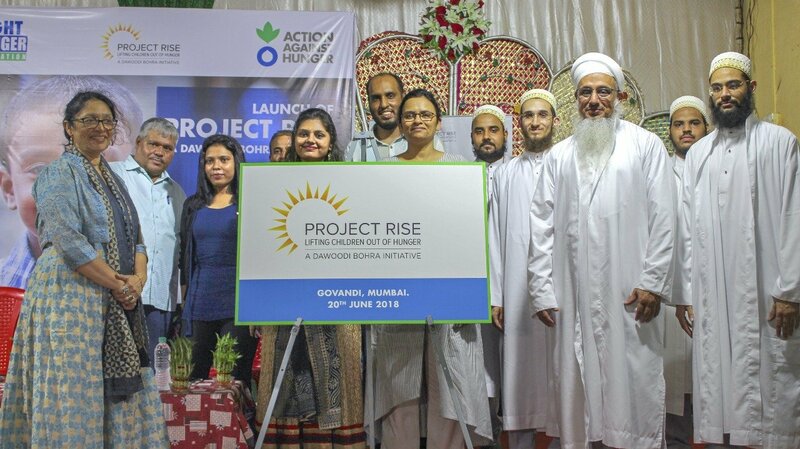 The Dawoodi Bohra community on Wednesday launched Project Rise, an initiative to fight hunger and malnutrition, in partnership with Fight Hunger Foundation, a non-profit and a part of global network Action Against Hunger. To start with, the project will support families in Govandi and Mokhada in Palghar district that are facing malnutrition and lack of sanitation. Sadiq Jamaludin of Project Rise said, “In Mumbai, Project Rise will focus on combating malnutrition and providing mothers and local health workers with disease prevention techniques. Children suffering from malnutrition is both tragic and ironic, given this city is the country’s financial hub. We’ll strive to create a hunger-free India.” He added that the community’s spiritual head, Dr. Syedna Mufaddal Saifuddin, has often said those in need and those who come to their aid both ‘rise’. The initiative has chosen Govandi due to its proximity to the Deonar dumping ground, and sanitation-related issues that arise due to this. Mokhada was chosen because its residents are largely dependent on agriculture. When there are adverse conditions, like less rainfall, they face malnutrition and lack access to healthy food and water. As the launch of Project Rise coincided with Eid-ul-Fitr celebrations, food was distributed under the Dawoodi Bohra community kitchen programme. The event also saw local artistes performing an educationa skit on malnutrition, its symptoms and precautions.